« You Got A Problem?!?! 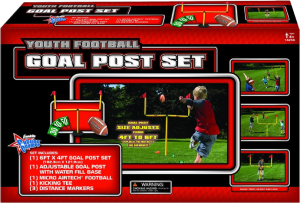 Review of the Franklin Sports Future Champs Youth Football Goal Post Set – thumbs up! Ok, I’m willing to bet that this is something you never knew existed or you have never seen in stores or online. This review is dedicated to the geeks at Amazon for whatever the hell link or cookie or cupcake or whatever they do that figured out that I like football, and I like my son and I like to get football things for my son. Otherwise I would never ever have seen, let alone purchased this item. One fine day around the holidays I was scoping the internet for what I think at the time was a deal on a snowblower (review to come on that one) and low and behold what does Amazon recommend for me? A PVC pipe Goalpost set! Are you kidding me? Do I want this? OF COURSE! The Franklin Sports Future Champs Youth Football Goal Post Set itself comes in a pretty small box easy to set up, kind of like putting together an erector set, simple really. It comes with mini yardage markers that you can set up. It actually ends up pretty decent size as long as you are playing with a little kid (my little kicker is 5). The base is plastic and can be filled with water to weigh down the set and make it steady, it does leave a little to be desired in this regard. It’s a little flimsy when it’s upright. But this is literally the only one of these I’ve ever seen. You could try and make it yourself, but for $35 its already yellow, it comes with a little tee, football, and flags. I say buy it. Your little one will lose interest in the damn thing in about 30mins and then only play with it every few weeks for like 10 mins. Trust me I know from experience. The best part was when he first saw it. He literally exploded with excitement!